I can’t say I know exactly what Kanye West is banging on about when he drops the word ‘swagu’ into a Beyonce song ( to be honest I don’t know exactly what he’s banging on about most of the time, especially when it concerns leather jogging pants, but hey, at least he’s bloody entertaining), but it rhymes with ragu and that really is all that matters. I think I’ve recently gotten into a bad habit of choosing to cook and blog about fairly simple recipes that haven’t really pushed me at all or caused me to learn anything, so I decided to make something needing a little more time and effort spending on it then just chop ingredients, put in saucepan. Considering one of the points of this blog was to expand my repertoire, I’ve done a great job of cooking a lot of Mexican, Asian and baked goods, and not a whole lot else! So I did a little research on my favourite recipe archive (Pinterest – if you love cooking then Pinterest is a form of social media that you really cannot do without. 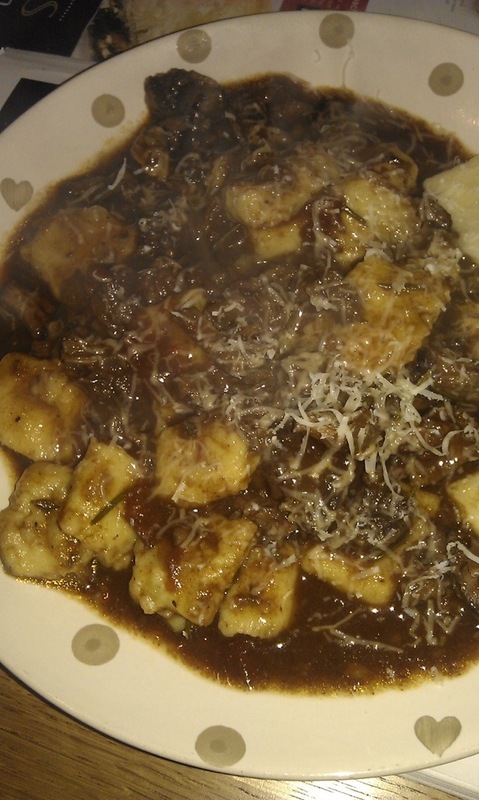 You’d be a mug not to get on it) and found a pretty delicious sounding recipe of beef ragu with Parmesan gnocchi. Much as I completely love my cookbooks, lately I’ve found myself more and more drawn to trawling the internet for recipes. Finding a recipe to match your hankering in a cookbook can sometimes take forever to find just the recipe you’re after, whereas all you need to do online is type in your craving or the ingredients knocking about the kitchen and you will instantly have found something to cook. Admittedly it can be a little hit and miss, but so can cookbooks, even by the most beloved authors and chefs. This recipe though was definitely a hit and came from the food blog Simply Delicious. I’ve been wanting to make gnocchi for ages but had never gotten around to it, preferring the ease of the ready made gnocchi in packets, which are hard to beat for an accompaniment to Italian sauces. The one thing that had been holding me back from making gnocchi was the fact that it involved mashing potatoes. I love mashed potatoes, pure comfort, but detest making them. I do not have the patience to mash every single particle of potato, have the most pathetic plastic masher from Ikea that feels like it would snap were you to put any actual pressure on it, and my upper arm strength is completely pathetic. If you could see the struggle on my face at the gym when attempting the shoulder press, you’d understand my plight. It would be comical if… Actually no, it really is comical. These three elements do not a lump free masher make. Oh, sure, I could buy a potato ricer, and I guess I could put a little more effort and patience into my mashing technique, but really, when you can just pick up a perfectly decent cheddar mash from Waitrose, why bother? It’s not sophisticated, it’s not ‘foodie’, but I don’t care. I like the easy life. I’d like to say that I managed to knock out some perfectly smooth mash to go into my gnocchi, but in my impatience I took the potatoes out of the oven a little too soon and whilst they were just about cooked, they weren’t soft and fluffy enough to make mashing easy. I therefore make no apologies for my lumpy gnocchi, which weren’t entirely pleasant to eat, but at the same time were weirdly satisfying. To the partially mashed potatoes I also added flour, an egg yolk and grated Parmesan, then rolled into little sausage shapes and cut little gnocchi cubes out of it. Pretty simple really. Luckily for me, the ragu more than made up for my very unprofessional gnocchi. Making the ragu was much simpler, and just involved chopping up a few ingredients and chucking into a casserole dish. I used shin of beef, which is one of, if not the cheapest cut of beef and left these shin ‘steaks’ whole as they would be effortless to shred later into the ragu. Like most cheap cuts, the shin needs long, slow cooking to ensure the fat melts away and the meat becomes meltingly tender. You want it to fall apart at the mere sight of a fork, and that is exactly what my shin did after 3 hours in the oven. The beef is cooked in a deep, rich sauce made up of onion, garlic, rosemary, thyme, red wine, beef stock and tomatoes and smells beautiful whilst cooking. This ragu is exactly the kind of dish that you crave on a miserable weekend when you’ve been caught out in the pouring rain and you can hear the wind howling down the massive gap in the chimney where the old boiler used to be… Or is that just me? Either way, it’s warming, rich, immensely savoury and absolutely perfect. Once the ragu is ready, you stir in the cooked gnocchi, serve and cover with freshly grated Parmesan and hoover it all up. I made enough for dinner tonight and I’m pleased to report it’s just as good reheated the next day. I’m sure you could cook this in a slow cooker, although I think it will miss the intense heat of the oven and needs that to ensure it’s not watery and insipid. This sauce needs to be smooth, rich and unctuous, and the only way you can guarantee that is cooking in the oven for the best results. Gnocchi is the perfect partner for this too, the starch thickens the sauce a little on adding the gnocchi to the sauce, and then the gnocchi absorbs the beautiful, winey ragu. Italians absolutely know what they’re doing, making a cheap cut of meat go a long way and tasting far more expensive than it actually is. If you’re needing a little warmth in your life without spending a fortune, this is the way to go about it. One lesson has been learnt though from making my own gnocchi – just buy it ready made next time.